We’ve just released a new version of our app and amongst the many improvements, we’re really pleased to have our new Background Checks in place. 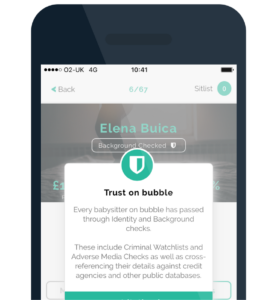 Now, every babysitter on bubble is cleared through an identity check and an online background check before their profile goes live. This is part of our mission to build a platform and community that offers parents and sitters the safest, most trusted way to arrange their babysitting. We’ve partnered with a cutting-edge technology platform that uses machine learning and artificial intelligence to screen individuals for some of the world’s biggest banks and financial institutions. The checks our sitters now go through include criminal watch-lists, sanctions list and an adverse media check that use millions of data points to flag any negative behaviour. And this check is updated in real time to capture anything that might occur once a sitter is signed up. More so than any piece of paper – we firmly believe that social recommendation is how parents love to find their sitters. As parents, we want and do book the babysitters are friends, family and colleagues love and trust. Our social networking and review features allow parents to tap into their trusted local networks to find great sitters. We’re complementing this by using innovative data and technology-led methods to screen our babysitter base. We’re, of course, not stopping here when it comes to building out trust on bubble, and are already talking to other innovative technology providers about additional checks that can be put in place. Ultimately, it’s the Mums and Dads on our app who determine which sitters they want to book. And what we’re clearly seeing is how this decision-making is being driven by various factors; such as the type of sit (e.g. daytime or evening), needs and ages of the kids, as well as a parent’s own sensibilities on this issue. We see our job as providing the information, functionality and transparency that Parents need to make an informed choice, quickly and easily. Adrian and I are both dads to young kids and like every parent on our app, they’re the most precious things in the world to us. Full stop. They’re the reasons why we started bubble in the first place. Granted, in part because we needed more time away from them…but also because we wanted to find amazing local sitters to take care of them when we’re not around. And we wanted to help our friends, family and parents everywhere do the same. That’s why we’re so enthusiastic about releasing new trust features like this one. Like everything about our start-up – it’s not the finished article – but a good next step. P.S If you have a view on this subject or ideas on other things we should be looking at then please do get in touch with me at [email protected] – I’d love to chat them through.